Red-eye tree frogs are amphibians that live in the rainforests of southern Mexico, through Central American and into South America. They are nocturnal (night) creatures who sleep during the day stuck to the bottoms of leaves with their eyes closed and their colors blending into the environment. These teacup sized frogs have bright green bodies, orange web feet, and neon blue markings on their sides. The most unique feature is their big, bright red eyes. Invite your class to participate in this cool project to learn about these fascinating frogs. Here are several ideas to try. Lily pads line the water areas where frogs live. Invite the children to do this art project where their fingerprints are the frogs that leap across the lily pad paper shape. Provide each child with a lily pad paper shape. Invite them to use their thumbs and dip them into green paint. Let them proceed to make fingerprints randomly jumping all over the lily pad. When the green paint is dry, show the children how to make the red eyes on each frog with a red marker. The red eye tree frog changes its skin color to blend with the surroundings. This protects them from predators. Invite the children to brush a thin layer of glue onto the shape. Have them place the tissue paper pieces on the surface of the frog, overlapping colors to make a camouflage look. When dry, draw in the tree frog’s infamous red eyes. Children love to manipulate hand puppets. Here is an easy red eye tree frog puppet. Fold the paper plate in half and then open it flat onto the table surface. Invite the children to sponge paint the outside of the plate with green and brown paints. Next, sponge paint the toilet paper tubes as well. While the paint is drying, cut out two red circles to fit the ends of the tubes for the tree frogs eyes. Also cut out a large red tongue. Attach the red circles to the ends of the tubes with glue or tape. Place the tongue inside the folded plate and let it hang out. Glue or tape the two paper tubes onto the top of the frog puppet for the eyes. Since frogs eat flies and other insects, cut one out from black construction paper and glue this onto the end of the tongue. Challenge the children to hold onto the folded plate with their hand and manipulate the large mouth. As you plan a unit on frogs, make sure to include projects on tree frogs. 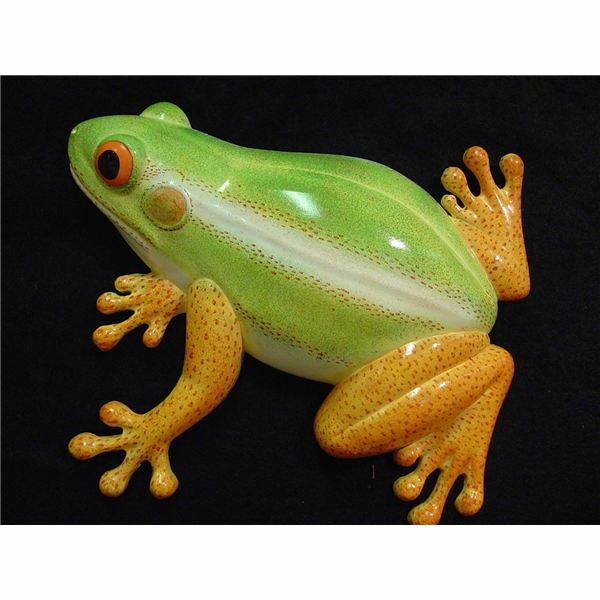 The children will “flip” over these cute amphibians.